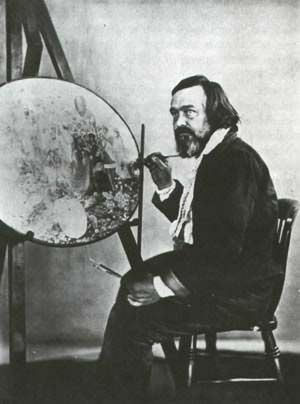 Richard Dadd was born in Chatham in 1817 and died in Broadmoor Hospital, Berkshire in 1886. He began formally studying art at the Royal Academy Schools in 1837. He founded a group of artists called the "The Clique." His early compositions such as Titania Sleeping showed hints of his incredible compositions of his later years. Dadd's life would change drastically in the 1840s. In 1842 Dadd took a trip to the Middle East with his patron, Sir Thomas Phillips. This trip agitated and disturbed him and he began to doubt his own sanity when he returned to London. He then entered a competition for the decoration of the House of Parliament, when his design was rejected his mental health began to seriously decline. Others noticed that his behavior had become more and more eccentric. He was suffering from the symptoms of schizophrenia and was hearing voices and experiencing hallucinations which were accompanied by delusions. He came to believe that his father was the devil and this culminated in the murder of his father he also attempted a murder of another person, a stranger, because he believed he was being directed to do these things. This resulted in his incarceration in the Bethlem Hospital ward for the criminally insane for the rest of his life. Strangely enough, some of his best works were composed in this setting. He was fortunate because he had psychiatrists and a family who encouraged him in his paintings even after his illness. His most prominent paintings Contraditction: Oberon and Titania and The Fairy Feller's Masterstroke were conceived of in the hospital. These painting were made for members of the staff at the hospital. He spent a total of 13 years working on these paintings feverishly. These paintings are truly extraordinary and the degree of detail displayed is amazing. To view his artwork click on the links below. Each painting and the circumstances surrounding it are described in more detail. 1. Christian, John. Symbolists and Decadents. Park South Books, New York: 1977. 2. Maas, Jeremy. Victorian Fairy Painting. Merrell Holberton Publishers, London: 1997. This book is excellent an excellent source of high quality faery art. It features all the famous Victorian illustrators such as Arthur Rackham, Edmund Du Lac, John Anster Fitzgerald, and many more. Click the link to learn more. 3. MacGregor, John M. The Discovery of the Art of the Insane. Princeton University Press, Princeton, New Jersery: 1989. Copyright © 2000 Lumalena Productions No part of this page may be reproduced without the consent of the author.